As if to make up for the fact that WildStar hasn’t had a single holiday event in its nearly one and a half years of existence, WildStar is currently running not only its Shade’s Eve Halloween event, but also a Back to the Future themed hoverboard racing event. I’ll start with the Halloween event. I guess I’m not really that big into Halloween. I mean, I’m looking forward to dressing up in my new Jedi robe and custom lightsaber (both of which I spent way too much money on), but other than that the whole thing is not that exciting to me. So when a game like WildStar gives me outfits out housing decorations that I can really only use in October without them looking out of place, I’m not as thrilled as other times. Christmas stuff I can at least put up in a winter/arctic themed house, or costumes on a character who’s supposed to be in or from a cold place, but I’ve never been tempted to make my character live in a haunted house or a graveyard. That would be depressing, and I don’t think of any of my characters as moping around in a ruined gothic cathedral when I’m logged out. It makes me appreciate games like LOTRO, who comes up with items that don’t look obviously halloween-ish. For instance, my theif wore that Mask of the Raven forever, and I loved the Cloak of Falling Leaves and used it on several characters. I’m sure there are plenty of people that are excited about WildStar’s Halloween giveaways, I’m just not one of them. Uninviting rewards aside, I did enjoy the holiday dungeon. The maze section was a little bit frustrating, especially the first time, but fortunately they eventually just show you the way out if it takes you too long (and yes, I know from experience). The whole thing has a uniquely WildStar feel to it; the maze and its flickering flashlight and the insane cultists were both very mature horror themes, but Jack Shade and the shadelings that pop up everywhere were so goofy and over-the-top it dispelled any real fear. It was a good call to not only make it an Adventure instance (formerly known as shiphands) that scales to fit parties of one to five players, but also bump all players to 50. I hate it when events like this end up either being something that has no actual combat, which makes them seem disconnected from the rest of the game, or has combat that higher level players just roflstomp all over, while us mid level players have to slog our way through. Apart from the dungeon is a variety of dailies that take place around your capital city, which hit a good middle ground between giving you something to do and just being a chore. My favorite is one that has you collecting floating plant fibers that turn you temporarily translucent. As for the hoverboard races, I really like what they’ve done with them. Games like LOTRO and Guild Wars 2 have done races before, but usually end up feeling a lot more awkward and gimmicky than what WildStar has put together. And the “WARNING: NO ROADS” notification that pops up when you hit a big jump is just awesome. I love the Back to the Future cosmetics and housing decor; you will definitely be seeing burning tire tracks if you visit my housing plot. It’s surprising how many games did homages to the Back to the Future hoverboard on October 21st. WildStar was unsurprising (they gave away a McFly-style hoverboard as a beta test reward, so we knew they were fans), and I guess Secret World isn’t terribly surprising given its modern setting and its recent inclusion of other, similar mounts, but Star Trek Online came as a surprise (a shame you can only use them on Risa). I snapped up the limited edition DeLorean hoverboard from the cash shop as soon as it was released. It’s pretty disappointing that, given its $15 price tag, it’s not an account wide unlock, especially since they’re saying they have no plans to ever bring it back. I actually thought maybe it was a typo, but alas it was not. 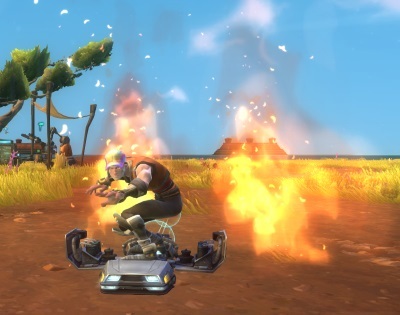 I don’t feel bad about it, though, because I’ve had a lot more fun in WildStar’s free to play in the last few weeks than in a lot of games I’ve sunk a lot more money into, so it’s worth splurging on a cool cosmetic, especially one as awesome as a DeLorean hoverboard.